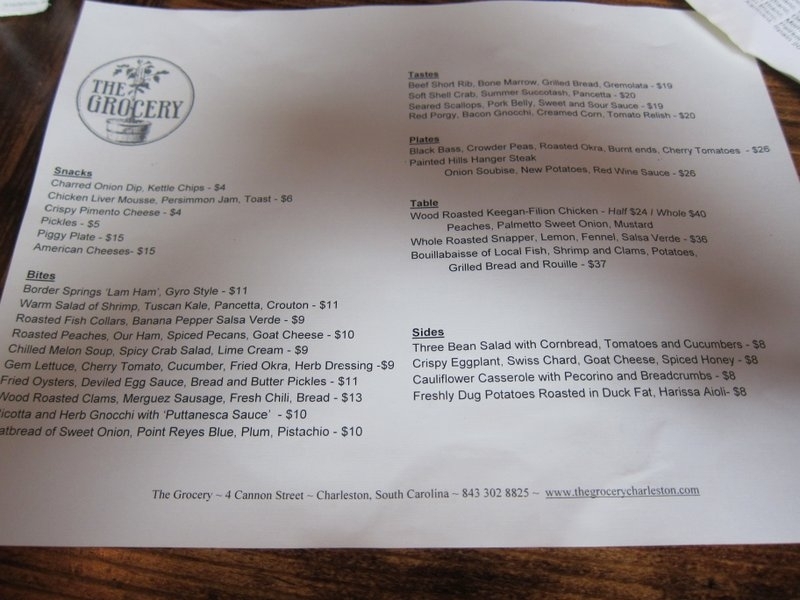 The Grocery, located on Cannon Street, is one of the new up-and-coming restaurants in Charleston. Well, according to Charleston City Paper or really any other food blog for that matter. But, if you read Eat King Street, you’ll see that it’s not one of our favorites. I mean, if you like stuffy atmospheres and high prices, this might just be your place. I don’t mean to be harsh, but, let’s face it: another French-sounding entrée just isn’t going to cut it anymore. Not when you’re competing with the likes of Husk and The Macintosh. 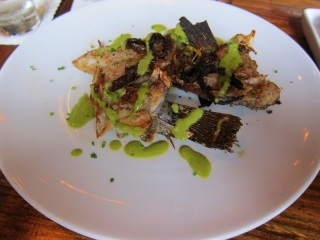 The WOOD ROASTED FISH COLLAR ($7) is a cut of fish next to the face, making the meat more moist. It was. 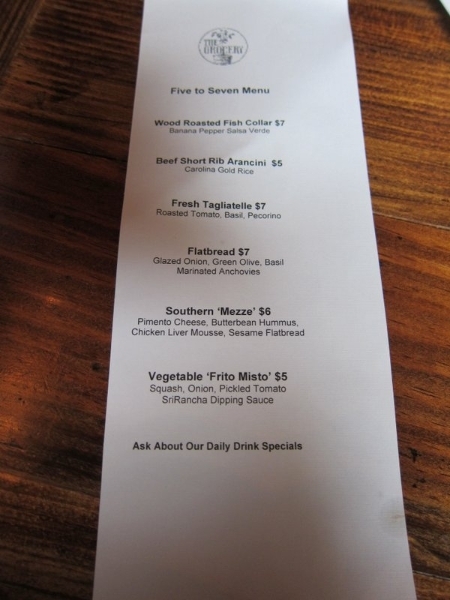 During Happy Hour, it’s $7, compared to $9 on the “Bites” menu. It’s served with a banana pepper salsa verde, but nothing could cover up the overly fish-y smell. I’m not sure what type of fish it was, but it was white and a pretty standard fish made extra good with the salsa and lemon flavor. Our waitress told us the fish collar was the “chicken wing of the fish.” And, although it didn’t look anything like a chicken wing, it was equally delicious. 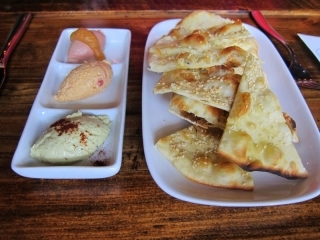 The SOUTHERN ‘MEZZE’ ($6) came with sesame pita chips and three dips: pimento cheese (pretty run-of-the-mill), butterbean hummus and chicken liver moose. Yuck. Chicken liver moose. Surprisingly, it was good: light and creamy with an apple or honey butter garnish. And I would have loved it if I didn’t know it had the word ‘liver’ in it. As it stood, though, I let Jeff eat most of that one and I ate most of the butterbean hummus. That was good. Really good. It was green and had more of a vegetable taste than normal hummus. Smoother, colder… Maybe this description doesn’t do it justice. I’d have liked to had three portions of this butterbean hummus and skipped the other two flavors. And the best part of the 5-7 Menu: BEEF SHORT RIB ARANCINI ($5), a Sicilian dish of fried rice balls coated with bread crumbs (The Grocery makes theirs with Carolina Gold Rice). Whatever rice they used, this flavor was so good and definitely the best thing we had. I think an entire meal of these fried rice balls would be pretty heavy, but the small plate was the perfect amount to split. They serve it with an orange sauce and parmesan cheese. I’d definitely recommend this, but unfortunately, it’s not on the regular menu (the beef short rib is listed under “Tastes” for $19). 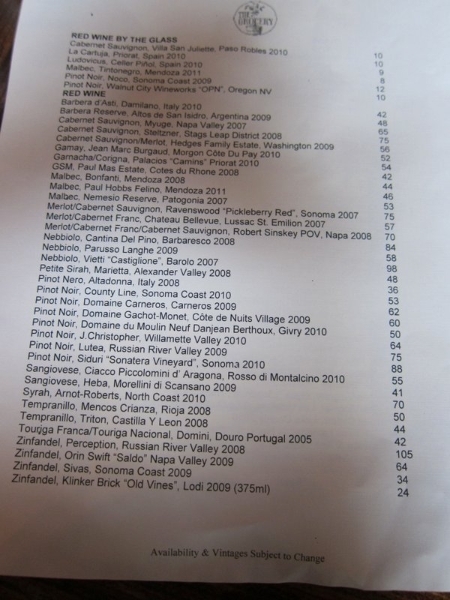 We’ve been for dinner before (sans camera) and left full and happy, albeit still confused with the menu. It offers snacks, bites, tastes, plates and table… all portion sizes I’m not familiar with and I’m sure no one else is either. 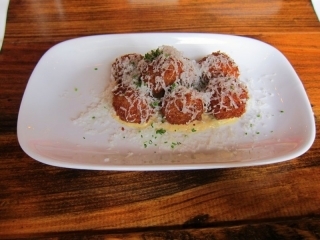 So, after asking the waitress, it turns out that snacks are individual appetizers, bites are appetizers to share, tastes are smaller entrées, and plates are big enough to share. Whew. I would have preferred to skip the confusion with just a normal menu. Entrées (and, by that, I mean Tastes and Plates) include typical fish and beef dishes (such as Seared Scallops with pork belly and wilted cabbage) along with obvious chef specialties (i.e., Beef Short Ribs with Bone Marrow and Grilled Bread). Your typical Charleston fare. Even still, after eating dinner at The Grocery, we wanted to go back to try its Happy Hour specials. And, if you really, really, really want to try The Grocery, I’d suggest you do the same. BOTTOM LINE: The Grocery has a decent selection of food that promises to keep you full, but I’d probably spend my $150+ for two at another restaurant. We like character, uniqueness and a little extra umph–we’re trying to leave feeling impressed, ya know. 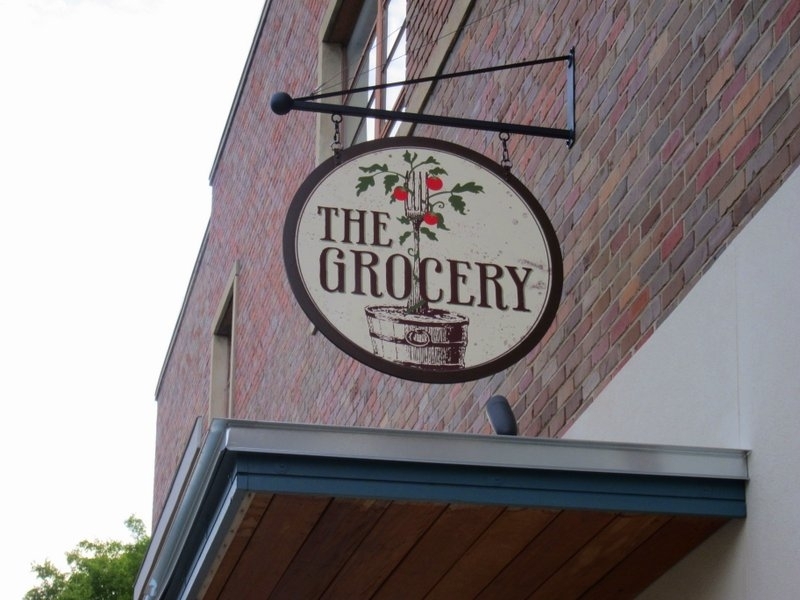 And The Grocery? Not it. Hello! Yes, we went there (without a camera) for dinner once. I had the scallops, and they were good. Like we said in the review, the food is really good, but the atmosphere is a little lacking. Definitely worth trying though.